Ancestral Discoveries: More Newspapers Online! I have found many new links over the past few months to add to the Wikipedia online newspaper archives page. The links include three new country listings (two of which are just correctly classifying existing links) and one new state for the U.S. The big winner this time is Hungary, with five additions. Several of the new collections are subscription, but most are free. • Ontario, Canada: The Newmarket Public Library (in the York region of Ontario) apparently provided ten newspapers to create the Newmarket's Digital Newspaper Project (free). • China: In 2014 the complete North China Daily News, 1850–1951, was digitized, but only three years were available, and those through a ProQuest subscription. Now it appears that access to the entire collection is available. This is a paid site and might be institutional only. • England: The Daily Mail for 1994 to the present can be freely read. • England: The Teesdale Mercury, an independent newspaper from County Durham, has been digitized for 1855–2005 (free). • Germany: Der oberschlesische Wanderer is online at two sites, one German (33 years between 1833 and 1936) and one Polish (42 years between 1828 and 1938), with different coverage between the two. Both are free and have images only with no search. • Hungary: The Arcanum Digitheca has ten newspapers and is a pay site. • Hungary: Zalai Közlöny ("Zala Gazette") for 1862–1945 is free. • Hungary: Eger, a magazine with political and other content, has been digitized for 1863–1944 (free). • Hungary: The Hungaricana Library has several newspapers and can be used with an English or Hungarian interface (free). • Hungary: The Middle and Eastern European Digital Forum has about a dozen German-language newspapers covering the 18th–20th centuries (free). • Iran (new country! ): A collection at the University of Manchester has been digitized for three historical periods (free). A recent article discusses the collection and its importance. • Isle of Man (new category) - The Manx Newspapers and Publications site, which includes World War I German-language internment facility newspapers, was formerly listed under England (pay). • Northern Ireland (new category): Two Belfast links were moved from Ireland and into a new Northern Ireland subheading under the United Kingdom (free). • Poland: The Lodz/Litzmannstadt Ghetto Chronicle was not actually a newspaper, but it has detailed information about the day-to-day events in the ghetto (free). • California: The Clovis Roundup has two online archives, one a monthly listing on the paper's site and the other via Issuu (free). • California: Newspapers from the Glen Park neighborhood have been added to the collection of San Francisco neighborhood papers available on the Internet Archive (free). • California: An obituary index for Tulare County for 1859–2012 is available through the Tulare County Genealogical Society (free). • Iowa: The Daily Nonpareil for 1857–1964, which was digitized by NewsBank, can be read online by Council Bluffs Library cardholders. • Michigan: The Caro Area Public Library has placed the digitized Tuscola County Advertiser for 1868–1942 on a site with Caro High School yearbooks for 1922–2006 (free). • Missouri: Newspapers.com, the online newspaper site owned by Ancestry.com, has digitized the St. Louis Post-Dispatch for 1874 to the present as a pay service. • Missouri: On the other hand, the St. Louis Public Library has free obituary indices for the Post-Dispatch for 1880–2014 and for the St. Louis Argus, a historical black newspaper, for 1915–1919, 1921–1927, and 1942–1945 for free. 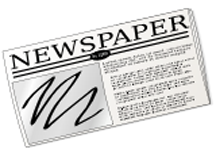 • New Jersey: The Asbury Park Press for 1905 to the present has also been digitized by Newspapers.com as a pay service. • New Jersey: The Plainfield Public Library has an obituary index for the mid-1920's through the mid-1980's for the Courier News available as PDF downloads (free). • New York: Obituary indices for the Suffolk Times (1920–present) and for obituaries found in the Gildersleeve scrapbooks (1915–1982) are online courtesy of the Mattituck-Laurel Library (free). • New York: The Queens Library has The Wave of Long Island for 1896–1900 online with somewhat limited flexibility of access (free). Click the link, click the plus sign by "Newspapers and Periodicals", then click the plus sign by "The Wave of Long Island" to see the individual years. • North Carolina: The Salemite, the student newspaper for Salem College, a women's college in North Carolina, is online for 1920–1990 (free). • Ohio: The Ottawa County Exponent for 1897–1957 is online at the Oak Harber Public Library (free). • Pennsylvania: The University of Pennsylvania newspaper, the Daily Pennsylvanian, is online for ranges of years between 1885 and 1995. I believe the plan is eventually to digitize all years. • Texas: Another student newspaper, The Lariat of Baylor University, has been digitized for 1900–2015 (free). • Washington: Green River Community College's newspaper, the Green River Current, is available from 1965, the year the college was founded, through 2015 (free). • West Virginia (new state! ): The first item for West Virginia is an obituary index for Parkersburg and Wood County newspapers for 1841–1890, 1896–1902, and 1930–2007 (free). It isn't digitized, but it's worth noting that the only known surviving copy of The Colored Enterprise, dated December 15, 1897 (issue #15), was discovered when a time capsule in Asheville, North Carolina was opened in June 2015. An article about the discovery said the newspaper and other items in the time capsule will be held in a collection at the state archives.